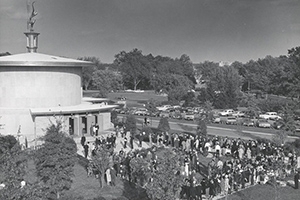 Crowds attend 1965's dedication of the Kay Spiritual Life Center. Photo courtesy of University Archives. 1965 was a turbulent year. The march to demand voting rights, from Selma to Montgomery, in the spring of that year turned into Bloody Sunday as the Alabama Highway Patrol descended on and beat peaceful marchers with rifle butts and billy clubs. Selma marked a turning point in the struggle to claim voting rights for blacks in the South. That same year at American University, something else of great import was happening—something that, in its own right, captured a vision about core identity and a more inclusive future. In the fall of 1965, the campus celebrated the dedication of the Kay Spiritual Life Center. This building, which symbolizes diversity of religious practice, opened the same year that national momentum built toward a more equal and just society. Although the two events are not comparable in many ways, they are both statements about fundamental values. Pressure for change in both instances had been building. As Dr. King catalyzed the conscience of the nation, visionary leaders at AU were convinced that there should be an interfaith space for people of all faiths—and no faith—to exercise their religious rights and practice their convictions. Dr. King’s courage had sparked a non-violent social movement that was shaking the foundations of the nation—especially in the South. But these changes were not coming without great sacrifice and cost. Because of the passage of the landmark Civil Rights Act the year before, African Americans were experiencing homegrown terrorism. Demonstrators were being beaten, their homes were bombed, and as they tried to cross the Edmund Pettus Bridge on their way to Montgomery, John Lewis and Hosea Williams and other marchers were beaten senseless. No violence was associated with the construction of the Kay Center. No one was beaten or killed in pursuit of it. But what AU President Hurst Anderson and Abraham S. Kay did 50 years ago was nevertheless courageous. Anderson, a Methodist, and Kay, a devout Jew, agreed completely about creating an interfaith center. But there was no roadmap. They were not following a script or mimicking what other universities had done. Nationwide, there were virtually no examples of a campus space that would be equally open and welcoming to people of all religious persuasions. Both men’s convictions allowed the possibility that other spiritual insights were equally deserving of respect and that their adherents were equally children of God. In today’s climate of greater cultural sensitivities, it is helpful to remember that religious exclusion and quotas at major elite schools were at that time still the norm. Anderson and Kay shared a vision that not only foreshadowed what was to come; it paved the way for changes that decades later would sweep across university campuses all over the country. Today the interfaith character of the Kay Center is part of AU’s DNA, continuing to be a shining example of early efforts to foster an interfaith community through building and architecture. For the past 50 years, the Kay Center has symbolized redemptive goodwill and welcome to everyone. For the past 50 years it has been a permanent monument to the embodiment of a vision of compassion and inclusion. For five decades, the Kay Center has continued uninterrupted with its vision to give expression to our better angels by providing a safe place for everyone to pursue the deeper yearnings of the human heart for authentic community. Reverend Joe Eldridge is university chaplain at AU.